The first mention of the Roman World survey occurs some 400 years after the purported event. A single text was written describing how Julius Caesar, c54 or 44BCE instigated the survey. Thus the subject is fraught with difficulty. There are no contemporaneous texts or even hints in texts to confirm that this mammoth undertaking was carried out. Thus we must look to other methods of research to build a picture from which we may be able to plausibly, although only circumstantially, determine the veracity of the original text. Sumer and Mesopotamia, 3200 to 331BCE, plus the Assyrian, Mede and Persian Empires: Egypt, c3000BCE to 332BCE: the Indo-European cultures of Crete, Mycenae and early Greece, 2600-1400BCE: Asia Minor, Palestine etc, 2000-500BCE and then to 332BCE. Further east we have the Indian sub-continent civilisations from 3000 BCE to 700CE, and the Chinese civilisation 1500BCE to 200CE. Of these, it is the civilisations surrounding the Mediterranean and Black Seas which will provide the technical ability for a world survey. But, having expanded around those littorals, the Phoenicians, Carthaginians and Greeks, were finally supplanted by the Macedonians in 336BCE and the empire of Alexander the Great. His empire encompassed Greece, Egypt, Asia Minor, and the Near East to the Indus Valley as far as the borders of modern day India. From these civilisations came systems of measurement, methods of surveying and their vision of the oikoumene. But it was from Sumer that the fundamentals of surveying arrived, and the method of presentation via the sexagesimal system. Greek scholars were thus in a position to receive new knowledge, to amplify it, and to place it on a secure mathematical basis. That occurred around 1000BCE, and perhaps the first text from which it is possible to draw a map, that of Homer c900BCE. We know of many scholars, geographers and cosmographers prior to the age of Rome, such as, Anaximander 610/546; Hecataeus 550/476; Dicaearchus 350/285; Eratosthenes 276/194 (texts Es1 & 2); Hipparchus 190/120 and Posidonius c150/130BCE (see also cgPl2). In that period texts were written full of geographical information such as “The Histories” of “Herodotus of Halicarnasus”, 485/425 (text cgHs1); the works of Plato, 428/348; Xenophon 428/354; and Archimedes 287-212 BCE, all of which give information about the world, its form, size and the oikoumene ( text Cp4). Perhaps the most comprehensive information is in Herodotus who was writing c460/430BCE and actually lectured publicly in Athens, 446BCE. Therein are geographical facts from the Atlantic Ocean to the Caspian Sea, from Libya (Africa)/Ethiopia to the Russian Steppes, thus encompassing most of the then known world and capable of being used to give it a tangible size and description. Therein are basic truisms, where Herodotus discusses the voyage made by the Phoenicians around the Libyan (African) coastline, where he states (Book 4-42) “as they sailed on a westerly course round the southern end of Libya, they had the sun on their right – to the northward of them”. But being Herodotus, who appears to require some proofs, he precedes that statement with the comment “that he does not believe them”. This is a most important fact and could have aided a better understanding of the world, but it was ignored, because of the Greek belief in the Torrid Zone and that no life existed in the south. (Note this belief continued well into the 5th century CE). “Cleomenes however was on the throne when Aristagoras of Miletus came to Sparta. According to the Spartan account, Aristagoras brought to the interview a map of the world engraved on bronze showing all the seas and rivers. Here Aristagoras produced the map he had brought with him. “Look”, he continued, pointing to it, “next to the Ionians here are the Lydians – theirs is a fine country, rich in money. Then come the Phrygians, farther east, richest in cattle and crops of all the nations we know. And here, adjoining them are the Cappadocians – Syrians, we Greeks call them; and next to them the Cilicians, with their territory extending to the coast – see, here’s the island of Cyprus – who pay annual tribute to the Persian King of 500 talents. Now, the Armenians – they, too, have cattle in abundance; next to them, here, the Matieni. Again, further east, lies Cissia; you can see the Choapses marked with Susa on its banks, where the Great King lives, and keeps his treasure. (Cleomenes asked Aristagoras how far Susa was from the Ionian coast; he answered truthfully and said it took three months travelling). “Cleomenes stopped Aristagorus from saying any more of the road to Susa. “Milesian”, he cried, ”you must leave Sparta before sunset. Your proposal to take Lacedaemonians a three months’ journey from the sea is a highly improper one”. Accepted, we only have reconstructions of the original cosmographer’s maps where Ocean is shown as a river around the landmass, a circular form, but the Caspian Sea is shown as an inlet to the Northern Ocean. Obviously Herodotus had excellent information. Thus it is possible to suggest that at the time of Herodotus there must have been two very different extant views for the oikoumene and its form, c500BCE. But from the foregoing we can confirm there were maps available of the oikoumene which were verifiable by distance measures; but perhaps very limited in their overall context. Herodotus writes of the Persian wars, but it was one in which Greek mercenaries fought. One such band of men had as a member Xenophon, a follower of Socrates, who sought adventure. Thus we read of his exploits in his “Anabasis” or “March Up-Country”, the story of the mercenary army in the Persian War; it is the march of the 10,000 which for a cosmographer is a dialogue par excellence. The data is vital as it records the march from Sardis to Babylon, the battle at Cunaxa, and then the retreat northwards to the Black Sea and the return home via Byzantium. Thus we can place on one diagram the information available c350BCE and read of the Mediterranean Sea, the Aegean Sea, Asia Minor, the Black Sea and the Near East to the Persian Gulf and beyond. But in 336BCE a new force appeared, the Macedonians. The conquest of Asia Minor and the Middle East/Near East began. For our narrative there were fortuitously included with the Army of conquest two experienced geographers or Bematists, Baeton and Diogenes. Their duty was to measure the daily progress, record geographical details and those of the flora and fauna found on the march. The whole route of the conquest, plus the return, including the Macedonian navy sea route from the Indus to the head of the Persian Gulf, is documented. Thus, by the end of Alexander’s march the territories to Afghanistan and the Indus River were also catalogued, and distance measures well known. We can therefore assess what data was available prior to the purported Roman World survey from c54/22BCE and consider its purpose. In effect Europe from the Iberian Peninsula to the River Rhine and south through Italy and Greece was known. Asia Minor, Anatolia and the whole of the Mediterranean littoral was known. There was knowledge of the Near East, Persia and Afghanistan to the River Indus. It can be indicated, but only circumstantially, that the hinterlands of India to China were known as the trade routes were bringing Silk to the west, which was much admired and worn by ladies in Rome in the time of Julius Caesar. India was supplying spices on the same trade routes. There was knowledge of Libya/Africa from Egypt to the Pillars of Hercules and the Atlantic coastline to the Atlas Mountains. The eastern area of Libya, Ethiopia was also known as far south as Meroe and the Nile. Sailing routes were detailed in the various Periplus documents dating from c500 BCE. The voyages of Hanno and Himilco, Carthaginian explorers, who detail the West African coastline to the Gulf of Guinea (text Cp4) and the west coast of Europe were possibly available. And, we must not forget the extraordinary voyage of Pytheas the Greek, mid 4thC BCE. With such a wealth of information available we must question the need for a world survey, unless we misunderstand its raison d’être. Therefore we must examine the only information available to us and then try to evaluate the political as well as social imperatives of the age. Cosmagraphia Julii Caesaris; A. Riese, ed., Geographi Latini minores. “In the consulship of Julius Caesar and Mark Anthony the whole world was visited under four very wise and chosen men; Nicodemus the east, Didymus the west, Theodotus the north and Polyclitus the south. From the above date to the consulship of Augustus for the fourth time and Crassus, the east was measured in 21 years 5 months and 9 days. And from the above date to the consulship of Augustus for the seventh time and Agrippa (for the third time) the western part was measured in 26 years 3 months and 17 days. From the above date to the tenth consulship of Augustus the northern part was measured in 29 years 8 months. From the above date to the consulship of Saturninus and Cinna the southern part was measured in 32 years 1 month and 20 days. The whole world has 28 seas, 74 islands, 35 mountains, 70 provinces, 264 towns, 52 rivers, 129 tribes. The east has 8 seas, 8 islands, 7 mountains, 7 provinces, 70 towns, 17 rivers, 46 tribes. The western part has 8 seas, 17 islands, 9 mountains, 24 provinces, 77 towns, 14 rivers, 29 tribes. The northern part has 10 seas, 32 islands, 12 mountains, 16 provinces, 61 towns, 16 rivers, 29 tribes. The southern part has 2 seas, 16 islands, 6 mountains, 23 provinces, 46 towns, 24 tribes. But what exactly does this text tell us; measurements were taken, of what? To determine what? And to be used for what purpose? There is no hint of an answer. I must therefore postulate reasons why Julius Caesar required this survey. Professor T P Wiseman asked, “Can we believe the testimony of Julius Honorius and ‘Aethicus’ on the world survey of Julius Caesar?” He continued, “I think there are three prima facie reasons to answer, yes”. His reasons, all to do with the surveyors’ names and the fact that there are four segments, do not include what for this research is perhaps a more important question, one which I cannot find posed by anyone previously (text StM1). In 55BCE, Caesar wished to expand the empire. Pompey the Great, 63BCE conquered the lands from the Caspian Sea to the Red Sea and his triumphal monument included his statue surrounded by information on the 14 nations he had conquered. But in 53BCE, Crassus’ expedition to the same area was wiped out at Carrhae in Syria. Thus the east was lost. What that meant to Rome was disaster. The conquest of this land was therefore seen as a necessity to keep the food stocks of the City of Rome at a level which would avoid insurrection. It is therefore plausible to argue that need instigated the world survey, not only to find land capable of feeding an ever growing populace, but also to provide the mineral wealth, raw materials, including gold and silver, with which to pay the vast numbers of Legions and support the Roman War Machine. Thus the survey can be seen as a means of alleviating the chronic political troubles at Rome between patricians and plebs arising from land hunger for the poor citizen and veteran soldiers. But, Caesar was a patrician, although he managed to reduce the corn dole partly by exporting many of the poorer citizens to existing colonies, land distribution was achieved by confiscations. It is therefore plausible to argue a volatile situation existed. Julius Caesar was an educated man who had studied Eratosthenes, his map and texts, but he must surely have found them wanting some 250 years later (texts Es1 & Es2). He also admired Alexander the Great, and perhaps dreamed of far-off places. He was planning a campaign into Parthia when he was assassinated. That this survey was not borne out of altruism, as it may well have been if it was Greek inspired; was instead inspired by very practical peoples the Romans, and thus leads us to consider the personal political motives. Did he have in mind the compelling notion of holding a map in his hands, a map which showed the whole oikoumene of which he was master? The comments concerning the map by Tiberius Sempronius Gracchus of Sardinia, (although of our age, and he would not have known of them) “that it demonstrated the complete conquest by demonstrating complete knowledge of the world it now ruled”, may have in some way found a resonance in Caesar’s thinking as he considered the future, his and that of Rome. But nothing so far has been proof, even circumstantial, that a survey took place. If our dates are correct, given that they are 10 years prior to the Julius Honorius dates; that is to say the survey was actually commissioned c54BCE not c44BCE and the final report was dated to c22/18BCE, not c12BCE, there are some surprising possibilities. We can assume that Julius Caesar’s four commissioner’s report, the latest in 20/18 BCE, and Augustus, Caesar’s adopted son, now Rome’s emperor, required the world map. Marcus Agrippa was entrusted with the project, but was only required to update the work of Caesar’s commissioners. Indeed, according to R. K. Sherk (1974: 559, n. 80),’It was the conclusion of Klotz . . . that, although Agrippa had taken over much from Eratosthenes, he was a’ vir vere Romanus’ and accordingly gave a very high priority to Roman sources in the preparation of his map’. In fact, Agrippa’s task, continued by Vipsania Polla his sister, was actually completed by Augustus, as described in Pliny the Elder’s” Natural History” (3.16-17, 6.139). Whether it was completed in 7 or 6BCE is uncertain, Dio Cassius says not, but Strabo in the same period talks of “the chorographic map” (text cgPl2). One of the last provinces to be added to the Roman Empire some 100 years after Caesar’s death was Britannia. We are fortunate this island with its spectacular coastline was one of the last provinces, as by then surveying had been elevated to an art (or science) form; copious texts were being written on its procedures and maps for the Roman Army were the norm. Although quite late, we have the tombstone of a member of the 4th Cohort of the Praetorians where he describes himself as a ‘chorographiario’, a maker of maps. By studying the Roman made features in the landscape of Britannia we can infer that a survey of the whole territory/island/province took place and that considerable planning effort was involved in fixing the distribution of the Forts and laying out the road network. In c150CE, Claudius Ptolemy in Alexandria, drew his map of Britannia and named the new civitates, Legionary Forts, and the Legions dispositions (texts Cp1 & Rs1). That the occupation of Britannia included a survey of this, one of the last parts of the Empire, is therefore undoubted, and may have been partly instigated to complete the map in Rome, and most certainly to disseminate data (Polis etc) throughout the Empire and obviously to Alexandria. To produce a map it is necessary to ascertain fixed reference points for its construction. We tend to use a graticule, as did Claudius Ptolemy. By studying the Roman landscape, we can fairly establish their fixed points by the accuracy of their locations relative to each other (Rm1). First, if we examine the FOSS WAY, from LINDINIS/Ilchester to LINDUM/Lincoln, we find a precise alignment. It crosses the landscape on a line that is a 3:5 tangent ratio to North, and between the two node points the alignment is a precise 400 centuriae each of 20 Actus, or 284 Km (Rm2). At RATAE/Leicester, which is very close to the 300/100 centuriae point, we find a second alignment, the GARTREE ROAD, a Roman road aligned to CAMULODUNUM or Colchester. This road is set precisely perpendicular to the Foss Way and is some 230 centuriae or 163 Km distance. Camulodunum was the first Roman Colonia and capital in this Roman Province. Archaeologists and historians have remarked that whom-ever set out these roads knew the precise geographical location of their end points (text Rm1). In the landscape of Britannia there are many other examples of a very precise layout of roads which could only have been achieved with adequate prior geographical knowledge. There are other parallel road alignments and fort positions that occur at repetitive distances. These hint at the sequence of the military advance northwards (BAR 359, 2003). This placement across the Pennines from Yorkshire to Lancashire could not have been achieved without prior geographical knowledge. Proceeding north towards LUGUVALIUM (nowCarlisle), we can establish the next survey, another tour de force. From North Yorkshire the Roman Road, now the A66, is to BROUGH, near the head of the River Eden. From BROUGH fort a 45 degree or 1:1 ratio alignment to North has been set out to WREAY fort. It is based upon the side length east/west of a triangle of 24 Roman Miles. This is part of the basic surveying system of the Agrimensores or Geometres. The simplest pseudo Pythagorean triangle to use is 12:12:17, i.e. 2 x 12 x12 = 288 and 17 x 17 = 289. Substitute the 24RM side length and the Brough to Wreay line, the hypotenuse is correctly 34 RM. The actual alignment was meant to locate Luguvalium/Carlisle, 39RM from Brough. A simple extension of the hypotenuse line, the survey line, achieves that. The proof for this hypothesis is so very simple. The route from Brough to Carlisle is marked by four forts, namely Kirkby Thore, Brougham, Old Penrith/Voreda and Wreay. From Brough to Kirkby Thore on the survey line, or design alignment at 45 degrees, it is 13 Roman Miles, i.e. one third of 39RM. From Kirkby Thore to Voreda it is 13 RM and from Voreda to Carlisle it is 13RM. Brougham, situated between Kirkby Thore and Voreda, is precisely the mid point of the alignment, at 19.5 RM. In final confirmation of this survey, perpendicular to the line at Voreda is the fort at Troutbeck, distance 13 Roman Miles. Then, from Carlisle westerly around the Cumbrian coast-line and into its hinterland, “The Lakes”, we find the same repetitive distances to forts which were established sequentially in the period between Trajan and Hadrian (texts Rm1 and StM1). The position of these forts when plotted on plain parchment provides the skeleton framework onto which the coast-line and geographical detail can be appended. Later texts indicate the veracity of the survey and illustrate the complexities. Marinus has actually positioned it correctly and when the co-ordinates given by Ptolemy are used, he places it in the same position, and thus there is no discrepancy. A study of the Roman survey reveals the real picture. From London Bridge to the East Gate of Noviomagus, the design line for the Stane Street is a precise 3:5 tangent ratio to north and as such it is parallel to the Foss Way alignment. And yes, Marinus has the correct distance. Study the Roman landscape, and the survey becomes so apparent. The evidence for the Roman map construction is set in the landscape. The world survey commissioned by Julius Caesar and the world map which was completed before the beginning of our era are the only literary evidences of a proper Roman Map. It is possible that a Roman Map of Britannia was extant until the Dissolution of Monasteries. It was probably used as a guide for such maps as the enigmatic ‘Gough Map’ (text Gm1) and the basis for early geographers in England (text Cs1). The Romans by their careful placement of forts and road alignments have bequeathed a valuable survey asset which has hitherto been ignored in the cartographical and historical literature. There is sufficient circumstantial evidence to conclude that there was a Roman Mappa Mundi; it was displayed in Rome c23-79CE when Pliny the Elder was alive, and probably existed for centuries thereafter. The city of Rome, 476CE, was sacked by Odoacer and in effect the Western Roman Empire ceased to exist. Thus for some four hundred years the maps existence and usage is quite probable. Curiously for the first 50 years of the Christian era there appears to be no written evidence for Christ or his followers. It is not until the second century AD that Roman authors comment. In about 981CE, Abbot Gerbert, later Pope Silvester, studied illustrated manuscripts of the works of the Roman Agrimensores at the monastery of Bobbio, N. Italy, founded by St Columban and dedicated to St Michael (see Dilke 1961). It appears, therefore, that the documents of the Corpus Agrimensorum had been copied by the early Monks and thus formed part of their reading and instruction (Dilke 1971: 128). I propose that Christians based in Rome utilised Roman methodology which finally led to the standard or repetitive layout of monasteries enabling monks to move and utilise the system precisely as had the Roman Army with its standardised forts. Moreover, the early churches were based upon Roman buildings and it can be shown that when local churches were built in Britannia the measurements were Roman Pedes, not local measures (Connor 1987). But the Church did much more than just use Roman measures; it used the whole of surveying expertise to locate Churches in the landscape as a statement of power. Legends of apparitions of the Angel are well documented, with the first being at Monte Gargano in Apulia, Italy. In the city of Sipontum, c490CE, a man named Garganus grazed his herd on the side of “His” mountain, when a Bull separated itself from the herd and climbed to the mountain top. A search revealed the Bull standing in the mouth of a cave. Garganus, annoyed with the Bull, aimed a poisoned arrow at it, but, the wind turned the arrow about, and it returned to hit Garganus! The local people asked the Bishop for an explanation; he visited the cave, fasted for three days and received a visitation from the Archangel Michael (text Stm1). The second apparition supposedly took place in Rome during the papacy of Gregory, cAD590, who, whilst praying for salvation from the plague raging in the city saw The Angel of the Lord wiping a bloody sword and returning it to its sheath. The plague was stayed! In honour of the event he built a church above the castle of the apparition that is now called Castel Sant’Angelo, Rome, or ‘Castle of the Holy Angel’. That Angel is of course Michael! In c710CE, the Archangel Michael supposedly appeared for a third time, to the Bishop of Avranches in Normandy, France, at a place “in peril of the sea”, called Mons Tumba. The Bishop is instructed to build a church on the aforesaid Mount, as at Monte Gargano, Italy. The Bishop had doubts concerning the size of the church to be built, but finding a Bull hidden in a cave was ‘told’ to build to the circle of the Bulls hoof prints in the soil around the cave. This church is of course the magnificent edifice of Mont St. Michel. But, why should St. Michael and arrows affect sailing? Simply put, because Michael in Hebrew of the Talmud is the Saint of Water. I suggest the links are as follows; St Michael is associated with high places, arrows are straight lines; high points are for surveyors, and the Bull indicates a circle, with the whole an encapsulation of Babylonian/Persian/Egyptian/Greek/Jewish religious practices; a melange of the whole religious history. Add to this Romano/Greek technology, and? We have discussed three supposed apparitions of St Michael, but, in Europe, St Michael is used to name many high mounts. And, a curious phenomenon arises, lines can be drawn. 1) The commencement of the first line is of course our original apparition, Monte Gargano, now called Monte degli Angeli, situated geographically at 41.7N-15.98E. There are other mounts named San Michele in Italy that are indicated upon the diagrams, one to the south east of Monte Gargano which can be considered as aligned to the Time Line. 2) The second point is Monte San Michele, Italy, 43.55N/11.38E, 892 metres high. It is north of Siena in the Monti del Chianti. It is surrounded by places called San Michele. 3) The third point is the Sacra di San Michele, 45.10N/7.34E, on a peak west of Turino, Piedmont, Italy. The Abbey of San Michele, near the old town of Avigliana, was built on the peak of Monte Pirchiriano in the 11th Century. Note, this must be an infill to the original line. 4) The fourth point is the world renowned, and previously discussed site of Mont St. Michel, Normandy, France. Set on a rocky outcrop, Mons Tumba, in Avranches Bay, it has expanded since its inception c.710CE, to the most spectacular site and view for a church available today. Mons Tumba, in periculo Maris! Geographically it is at 48.67N/1.5W. 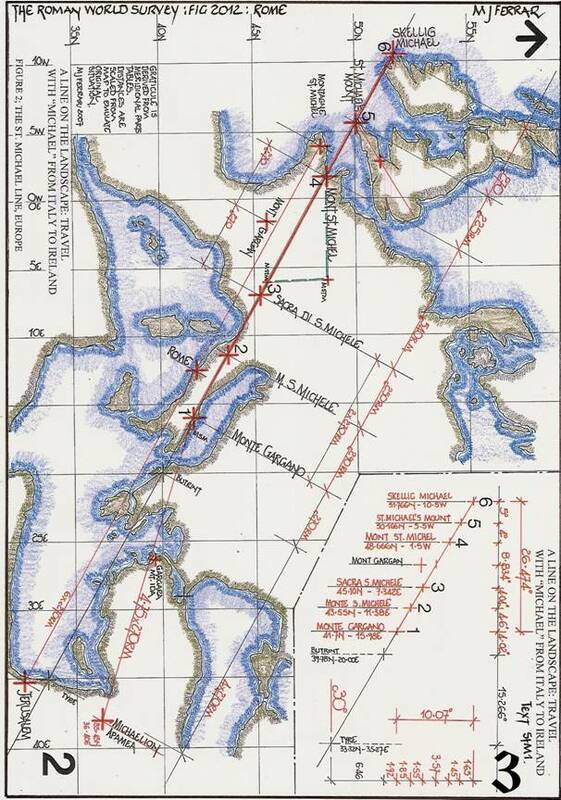 In France there are two further Mt St Michel’s, one east of our original site, geographically at 48.68N/5.88E, or 365 Roman miles east, and the second that may be considered part of the alignment is marginally south of the putative line, and just west of our third point , geographically 45.55N/6.08E. 5) The fifth point is similar, but also so very different; it is smaller. But, St. Michael’sMount, Cornwall, now sitting in a bay that has flooded over the millennia thus changing the site from a “Mount” originally known as Hore-rok in the wodd, to an island. The geographical location is 50.166N/5.5W. 6) The sixth point is a spectacular sheer sea mount, shaped like a perfect pinnacle rising out of the waters of south west Ireland. The Skellig rocks, and particularly Skellig Michael, became a haven for monks around c600CE, but it was in all probability abandoned in the 13th century (Moorehouse 1997). Geographically it is 51.766N/10.5W. These points which can be shown as linked to the Archangel Michael produce an alignment across the Roman world with an angle of slope c.30 degrees. The distances when measured on the map appear to be based upon 270 Roman Miles or one hundredth of the putative Roman World. This can only have been achieved with the use of an accurate scale map. The second alignment is from Jerusalem via Rome to Montagne St Michel, and the third line, indicates the alignment phenomenon in England (at an angle of c. 30 degrees) from St. Michael’s Mount north-easterly through Glastonbury Tor with St. Michael’s Church atop. So far we have ignored the geographical origins of the St Michael line in the Middle East. The alignment when projected south-easterly passes through Butrint, just misses the islands of Rhodes and Cyprus and thence to Tyre. The alignment then parallels the S. W. border of modern Iraq. This area was then not part of the Roman Empire and thus it is unlikely it was properly included upon the Roman mappa mundi. However, Roman Syria, between the northern reaches of the Euphrates and the Mediterranean was. In this area is the Michaelion (sanctuary of Michael) at Huarte/Haouarteh on Mount Diokleion in the territory of Apamea, (Canivet and Canivet 1987), geographically 36.40E/35.45N. Apamea is in the upper valley of the Orontes River on the Roman road from Damascus and Emesa (Homs) to Antioch and the Mediterranean. The Michaelion is in fact c.20.42 degrees east of Monte Gargano, but if we calculate using the meridional great circle of 40,009KM or 111.136KM per degree the distance is 1281 Roman Miles or 4.75 x 270 Roman Miles, a mere 69 Roman Miles short of a perfect 5 x 270 or 1350 Roman miles and as such marks perhaps a raison d’être for the spacing identified. That it does not form part of a St Michael Line is probably due to the split within the Latin Catholic West and Greek Orthodox or Eastern Church that developed. Thus we may speculate that the Christian scholars of the Latin west, who studied the texts of the Roman Agrimensores, and the mapmaker Claudius Ptolemy, and had the Roman mappa mundi for guidance, would only utilize points that were in their own sphere. Therefore, whilst we can construct an alignment within the Roman World, i.e., from Palestine/Arabia to Britannia [and Hibernia], as the diagrams indicate, the only patriarchate of the Latin world, Rome, no doubt thought of only Italy and the Western Church. DID THE EARLYCHURCH PRACTICE LANDSCAPE ALIGNMENT? Along the south coast of Britain there is one large island, Vectis Insula, Isle ofWight. It is mentioned many times by the Venerable Bede (Ferrar 2005, text Tp1). On the Isle there are 37 Church sites (Winter and Winter 1987), varying in date from the 7th to the 13th century. They vary in size from single cell Saxon to enlarged Norman edifices’. But, what is so striking is their location, in relation to the putative Roman Survey which was undertaken following the invasion of AD43 (Ferrar and Richardson 2003). The alignments of these early Churches appear to follow two of the putative survey lines. These are alignments of four Churches, (not three of anything on a map which is easy to achieve), and are geometrically and metrologically correct in both parallel and perpendicular alignments that form two squares in the landscape. They are set out dimensionally using the Roman actus, of 120 pedes, or 116.471 feet (text StM1). That the Church was capable of surveying/map reading is also illustrated by the metrology of their edifices. 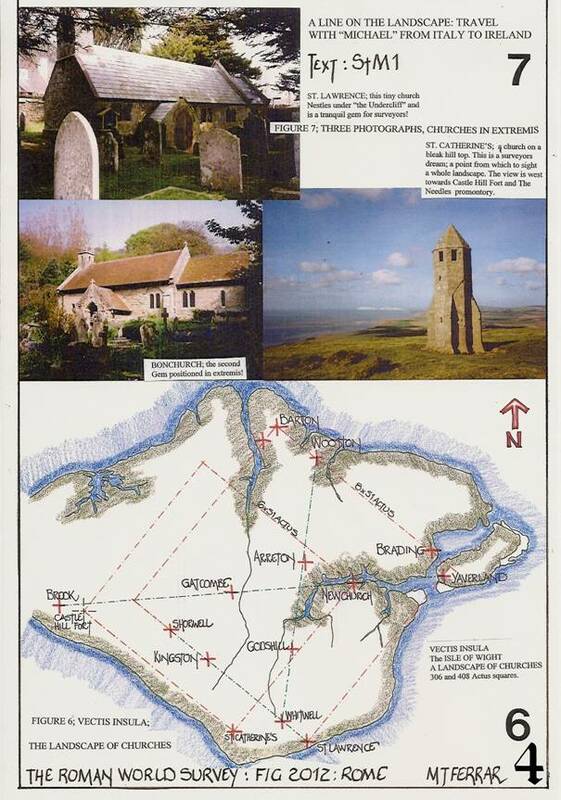 A study of the dimensions for these Isle of Wight and other Churches of the early period indicates that the Roman pes was the standard unit and that the survey techniques of the Roman land surveyors was used. The above is but one example of many such alignments which have been noted in several European countries, with some alignments having 8 churches. This phenomenon is also found with the locations of monastic establishments in England (Ferrar and Kelly 1998). Julius Honorius, some 400 years after the event wrote of a Roman World Survey; other than subsequent borrowing of the text there are no contemporaneous writings. But, by considering the knowledge gained by c54BCE, the presumed start date of the survey; and the events at its completion, along with landscape features made after the survey, it is possible to see that it must have occurred and accurate maps drawn. The landscape phenomena cannot have been conceived or executed without a world survey and accurate maps drawn. The works of Marinus the Tyrian and Claudius Ptolemy would not have had such specific detail had the survey not happened. Why Julius Caesar ordered the survey is as the text implies, nebulous, but the fact that it was ordered is certain. The Map of Agrippa has always been seen as problematic, but it is possibly the first map capable of providing correct data vis a vis the actual geographical world and as has been shown is no doubt the result of this world survey. But for a few lines of text written 400 years later we would not know of its existence. M J Ferrar December 2011. Aujac G. (1987) The growth of an empirical cartography in Hellenistic Greece. In Harley and Woodward Chapter 9. Canivet,P and Canivet, M. T. (1987) Huarte. Sanctuaire chretien d’Apamene (1Ve-V1e s.), 2 vols. Librarie orientaliste P. Guethner, Paris. Connor, R. D. (1987), The weights and measures of England. Science Museum, London. Dilke, O. A. W. (1961) Maps in the Treatises of Roman Land Surveyors. The Geographical Journal, 127.4, 417-26. Dilke O. A. W. (1971) The Roman land Surveyors. David and Charles, Newton Abbot. Dilke O. 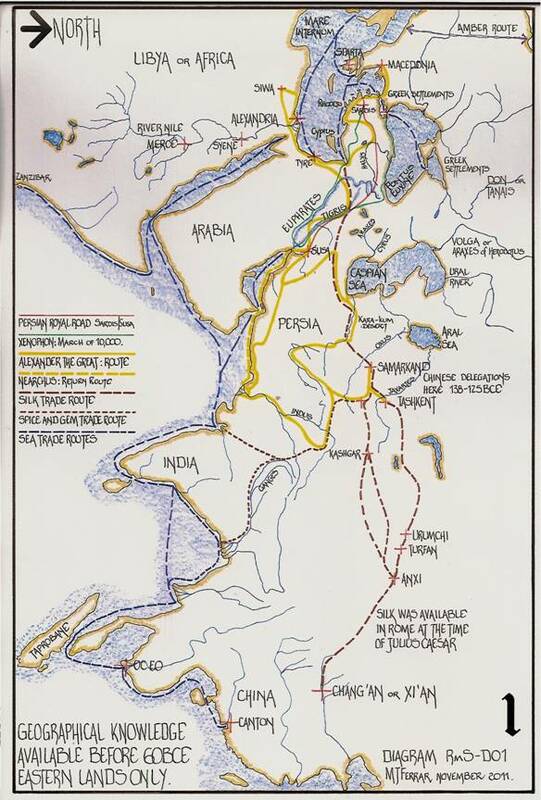 A. W. (1987) Itineraries and geographical maps in the early and late Roman empires. In Harley and Woodward, chapter 14. Ferrar, M. J. (2005) The Venerable Bede and the Tabula Peutingeriana. The Cartographic Journal, 42.2, 157-67. Ferrar, M. J. and Kelly, J. (1998), Wood Hall, The Mystery of an Anglo-Saxon Cathedral. Ancient, number 61, volume6, Feb 1998, Brighton. Ferrar, M. J. and Richardson, A. (2003) The Roman Survey of Britain. British Archaeological Reports, British Series 359, Archaeopress, Oxford. Harley, J. 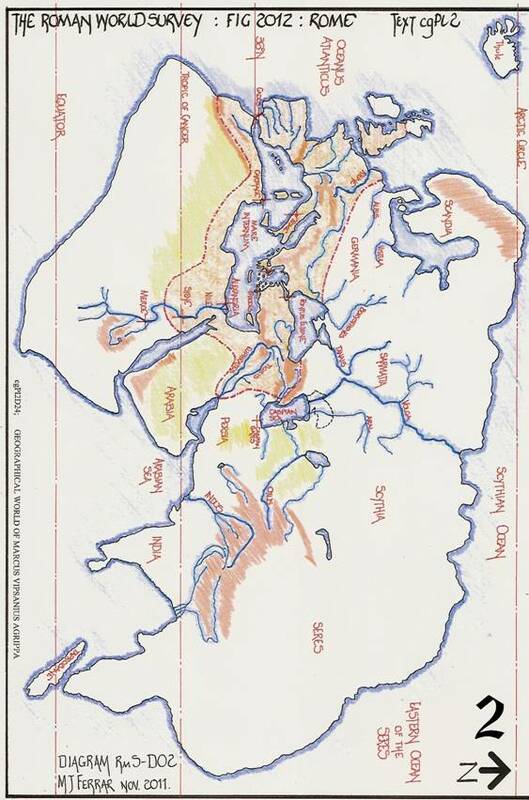 B. and Woodward, D (eds) (1987) The History of Cartography, Vol 1, Cartography in Prehistoric, Ancient, and Medieval Europe and the Mediterranean. University of Chicago Press, Chicago , USA. Moorehouse, G. (1997) Sun Dancing. Weidenfeld and Nicolson, London. Millenaire monastique du Mont-Sant-Michael, Lethielleux, Paris. 5 vols, 1967-1993, various authors. Sel, M. (1905): Michael. In The Jewish Encyclopaedia: a Descriptive Record of the History, Religion, Literature, and Customs of the Jewish people from the Earliest Times to the Present Day ( ed. I Singer). Funk and Wagnalls, New York, vol. VIII. Leon-Moravia, pp535-38. Sherk, R. K. (1974) Roman geographical exploration and military maps. In Aufstieg und Niedergang der Romischen Welt ( eds. Haase, W. and Tempotini, H.) De Gruyter, Berlin, II. 1, pp. 534-562. Winter, R. P. (1987) Village Churches of the Isle of Wight. Forget-me-not-Books, East Cowes. Wiseman, T. P. (1992) Julius Caesar and the Mappa Mundi. In idem, Talking to Virgil: a Miscellany. University of Exeter Press, Exeter, pp22-42. All un-named references are texts on this web site and include many more diagrams. I suggest that for a fuller understanding of the text at least the diagrams for text StM1 and both Rm1 and Rm2 are looked at. My texts all have a complete bibliography which will amplify the information given here and should be used for major research papers. Many have been refereed for publication. This text was submitted to and used at the F I G 2012 Rome History Seminar. M J Ferrar May 2012.